The South Korean canoe governing body said Tuesday it has made joint team proposals to North Korea for this year's Asian Games and the dragon boat world championship. 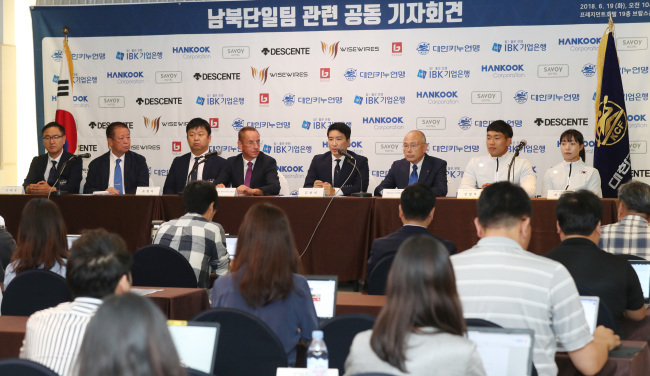 The Korea Canoe Federation also said it is in talks with the International Canoe Federation over co-hosting a future dragon boat world championship with the North. The 2018 Asian Games will be held in Jakarta and Palembang in Indonesia from Aug. 18-Sept. 2. The 2018 ICF Dragon Boat World Championship will be in Gainesville, Georgia, from Sept. 12-16. The KCF had previously expressed interest in forming a unified Korean dragon boat team at the Asian Games and began its Asian Games trials earlier this month, with hopes of having eight South Korean paddlers joined by North Koreans in Indonesia. The KCF's announcement came less than 24 hours after the Koreas agreed to push for joint teams at the Asiad during their sports talks at the border village of Panmunjeom. The Olympic Council of Asia has balked at granting the Koreas extra roster spots just so they can bring their teams together for the Asian Games. That dampened the mood somewhat for sports, such as table tennis, which saw a unified Korean women's team compete at the world championships in May. But dragon boat racing, a canoe discipline, won't require any compromise when assembling a joint team. The KCF has said the unified dragon boat team won't have to come at the expense of any current athletes because both Koreas don't have full-time dragon boat paddlers and the joint team will be formed from scratch. Kim Yong-bin, head of the KCF, said he was inspired by the unified women's hockey team at the PyeongChang Winter Olympics in February. It was the first joint Korean team in any sport at an international multi-sport competition and was hailed as a symbol of peace and Olympic ideals. "As soon as we saw the way the hockey team delivered a message of peace, we started preparing for a unified Korean team in canoe," Kim said. "And the ICF and the Asian Canoe Confederation have both offered their full support." According to Kim, the KCF is in the final stages of selecting South Korean Asian Games athletes, and North Korea is expected to finalize its roster in early July.